Barcelona, Spain – February 22, 2016 – Given the world’s latest and greatest mobile technology has been unveiled at MWC in Barcelona for almost three decades, it should come as no surprise that Powermat played a prominent role in this year’s event when Samsung, the world’s largest smartphone manufacturer, announced that its new Galaxy S7 devices will be embedded with wireless charging technology. 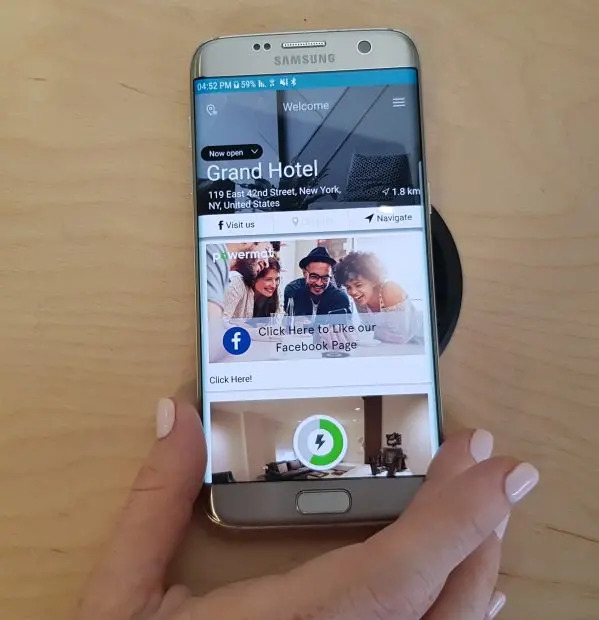 Both the Galaxy S7 and Galaxy S7 Edge will allow users to stay better connected than ever before by seamlessly accessing any of the growing number of Powermat Charging Spots in public venues across the world. Both devices are powered by the latest Android Marshmallow OS, allow for expandable memory and are water-resistant, repelling spills, splashes and even dunks so you can save the rice for cooking. Real-time updates are delivered with a single swipe, and since the picture on the screen wraps around the Dual-Edge design, you’ll see even more. The Galaxy S7 and Galaxy S7 Edge are also the first smartphones with dual-pixel technology, ensuring a fast auto focus for less blur. In addition to the S7 and S7 Edge, last year Samsung equipped both the Galaxy Note 5 and Galaxy Note 5 Edge with wireless charging, as well as the Galaxy S6. Forever a pioneer in the world of smartphones, Samsung has prioritized putting wireless charging technology in its latest devices because of the ever-increasing consumer demand. In the past year alone, Starbucks has continued its national roll-out of Powermat Charging Spots, and wireless charging technology has been introduced to universities on both coasts and added to even more General Motors vehicles Corian countertops. Powermat is once again thrilled to have our technology embedded in one of the hottest, must-have devices on the market today. Thanks to Samsung’s innovation and forward thinking, there is no doubt that we will accomplish our goal of delivering wireless power to more of the places people need it most. If you’re tired of running out of a juice and would rather live in a wireless world where it’s easy to power up your phone on the go, we encourage you to pick up a Galaxy S7, Galaxy S7 Edge or any of the other great Samsung devices mentioned above. You can also download the Powermat app to find out where your nearest Powermat Charging Spot is located.